A byelection has yet to be called for the federal riding of Burnaby South in B.C. 's Lower Mainland, but NDP Leader Jagmeet Singh has already spent the better part of a month campaigning for a race that could hold the key to his political future. A byelection has yet to be called for the federal riding of Burnaby South in B.C. 's Lower Mainland, but NDP Leader Jagmeet Singh has already spent the better part of a month campaigning for a race that could hold the key to his future as party leader. The stakes are high for Singh, who has yet to sit in Parliament a year after winning the leadership. Other parties are also watching the riding closely — including the Liberal government — which will ultimately choose when to call the byelection but has yet to decide whether its own party will even field a candidate. Singh knows he will face competition from the Conservatives' nominated candidate, Jay Shin, a corporate commercial lawyer who is active in the business community. And former Conservative leadership contender Maxime Bernier also hopes to run a candidate under his newly formed People's Party of Canada. "We will have a candidate if we can," Bernier said last Thursday on Parliament Hill. The Liberals are playing coy about whether they will extend a "leader's courtesy" to Singh, an occasional convention by which other parties decide not to field candidates in a byelection where a new federal party leader is running for a seat. Liberal Party spokesman Braeden Caley said while no nomination meeting has been set, the party hasn't ruled out running a candidate. "We wish Mr. Singh well ... and we're looking forward to a positive opportunity to contrast our ideas with the other parties," Caley said in an email. "Either way, I am not concerned. 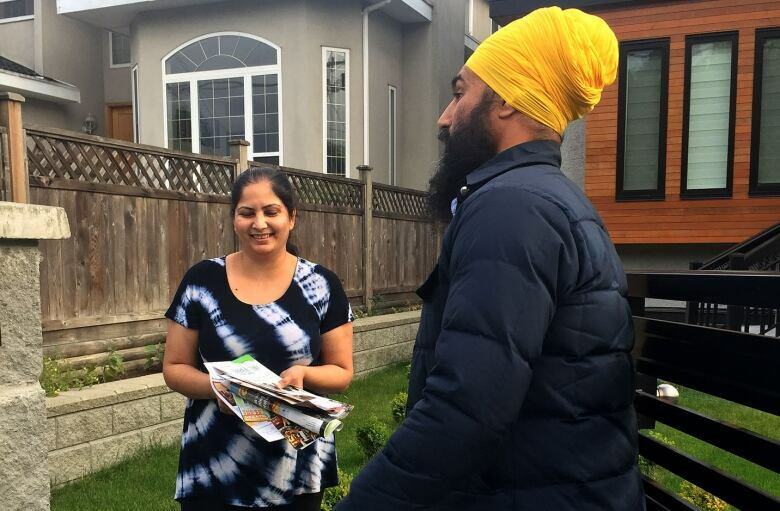 It's going to be the decision of the people of Burnaby South to elect who they will," Singh said at a press conference held in the riding on Tuesday. Green Party Leader Elizabeth May says her party will stand back and respect the leader's courtesy. "It may sound antiquated but I love anything that reduces the hyperpartisan toxicity [in politics]," May said. "I want to welcome the leader of the NDP to a place in the House before the election, because I think Canadians have a right to know and be more acquainted with the leaders of all the parties in the House before going to the polls." The riding of Burnaby South was created in 2015, when boundaries were adjusted to add 30 new seats across the country. Kennedy Stewart won the seat for the NDP by just 547 votes over the Liberals, but vacated it last month to seek the Vancouver mayor's chair. Singh is seen as needing to win this riding to emerge from the sidelines of Parliament's comings and goings since he was first elected as leader over a year ago. Quebec MP Guy Caron has been the voice of the NDP in the House of Commons' daily question period. 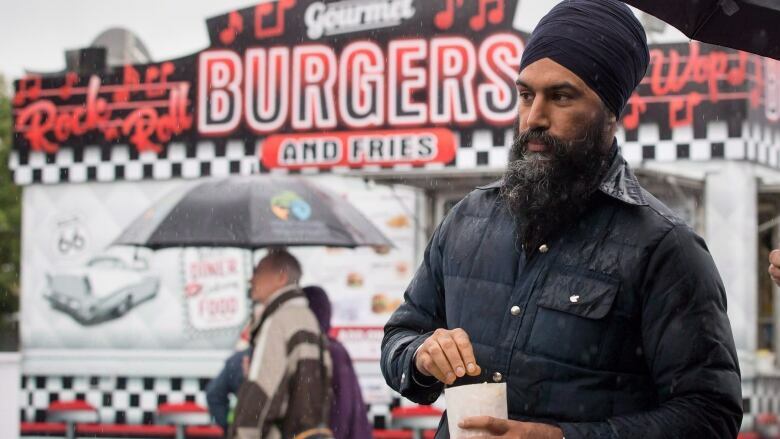 There have been divisions around Singh's leadership because of poor fundraising numbers and dropping support in the polls, as well as some policy stumbles and his handling of allegations of harassment within his caucus. Some Liberals have openly mused that having Singh around more frequently on Parliament Hill wouldn't be a bad thing, to contrast Singh with their own leader. But Prime Minister Justin Trudeau is under pressure from some B.C. Liberals who want the party to win the seat. Fisheries Minister Jonathan Wilkinson, a B.C. MP, is one of them. "You know, I would like to see a Liberal who is elected in every riding in this country," Wilkinson said with a laugh. Wilkinson said it could be a problem that Singh was helicoptered into the riding. "I think ultimately people are very committed to the idea that they have somebody who speaks with authenticity to the local issues. I know in my riding in North Vancouver, the fact that I've lived there for over 20 years and my kids were born there and I've been invested in the community was a really important thing. So I think that's a challenge that Mr Singh will have to overcome," Wilkinson told CBC News. Singh — who represented a provincial riding in Brampton, Ont. before jumping to the federal scene — isn't from Burnaby and hasn't even rented an apartment in the area yet. But he says he isn't worried about his low profile. "I'm more concerned in raising the profile of the problems that we're facing. I really want people to take in how serious the problems people are faced with when it comes to housing and homelessness," Singh said. "I am working with community groups to talk about what people are are facing," Singh said. "I am committed to making sure that I am that voice that hears the concerns people are raising and brings those to Ottawa." Randeep Sarai, Liberal MP for the neighbouring riding of Surrey Centre, says there are a lot of Liberals interested in running in the riding.